I have the privilege of working with several excellent pediatric sports medicine specialists at Nationwide Children’s Hospital. I’ve hit up a couple of them to write guest posts for this blog, including a review of the 2014 Female Athlete Triad Consensus Statement (Dr. Stacy Fischer) and a first-person account of being the medical director of a mass participation event, the Greater Ohio Bike Adventure (GOBA) (Dr. Tom Pommering). The newest doctor to join our group is Dr. Emily Stuart. I’ve had her in my sights to provide a blog post for the past few months. 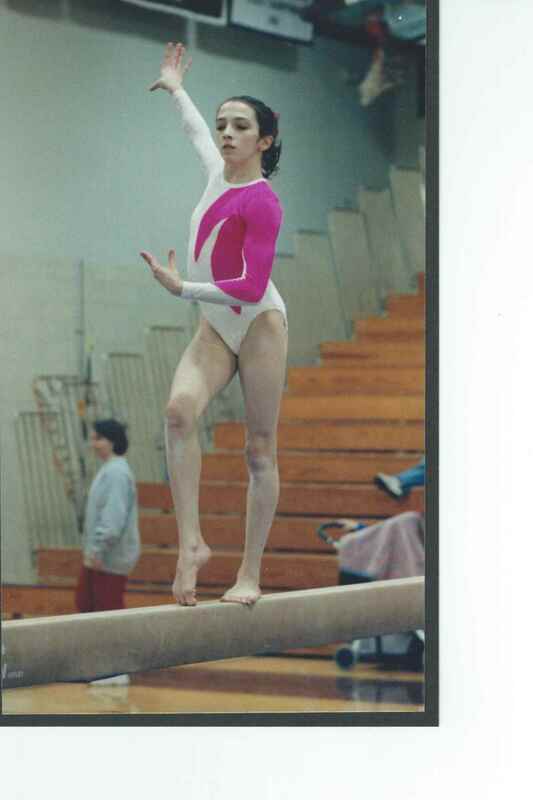 Besides being an excellent clinician, Emily was a level 10 gymnast until she retired at age 16 due to injuries. She coached for 10 years and now judges club and NCAA gymnastics. 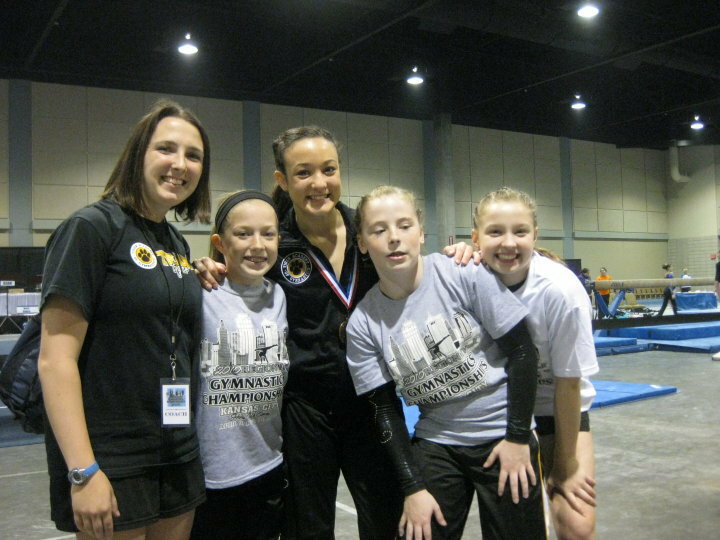 Although Emily enjoys taking care of athletes from all sports, she has a special interest in providing medical care for gymnasts. It’s because of her expertise both as a physician and as a gymnast that I asked her to review a book that was recently sent my way, the Handbook of Sports Medicine and Science: Gymnastics. A book review, by Emily Stuart, M.D. It’s been over 2 years since the US Women’s Gymnastics Team dominated the team and individual medals at the London Olympics . And in less than 2 short years, gymnasts from all over the world will converge in Rio de Janeiro for the 2016 Olympics. The Olympics is definitely the biggest event in gymnastics, but there is much more to the sport than what fans see every 4 years. Gymnasts spend years, if not decades, training to become the best in their sport. As a former gymnast, coach, and gymnastics judge I was excited to read and review the Handbook of Sports Medicine and Science: Gymnastics by Dennis J Caine, Keith Russell, and Liesbeth Lim. This book is part of a series produced by the International Olympic Committee (IOC) Medical Commission. Multiple specialists both with gymnastics knowledge and medical expertise contributed to the book. Thus, each chapter is very detailed and provides any gymnastics enthusiast with a wealth of knowledge. The book starts with a thorough history and evolution of the sport. In addition, it provides a brief overview of the various gymnastics disciplines that are part of the Federation Internationale de Gymnastique (FIG). The next three sections cover growth and development, training and performance, and finally, sports medicine aspects of gymnastics. The extensive review of physiology, including endocrinology and skeletal health is not necessarily specific to gymnasts, but also applies to all young athletes. Although I found some of these sections to be very informative, they also brought back some bad recollections of memorizing detailed pathways, such as the hypothalamic-pituitary-adrenal axis, during medical school! For anyone interested in basic or clinical research involving gymnasts, the most useful sections of this book are at the end of each chapter. These sections include brief chapter summaries and a description of potential future research opportunities. In addition there are lists of helpful references. Throughout, this book describes the limited gymnastics related studies and provides future directions for potential research. Although there have been a handful of studies on female artistic gymnasts, the literature is lacking in recent studies on male gymnasts, rhythmic gymnasts, and trampoline athletes. Furthermore, the rules in gymnastics change frequently. The Code of Points, the rulebook for gymnasts, is updated every four years in order to provide continued growth and new challenges for the athletes. With this in mind, it seems that studies on injury patterns from ten or more years ago may not necessarily apply to today’s gymnasts. In addition, to being a useful guide for anyone considering research projects on gymnasts, this book is beneficial for coaches as well. The authors do an excellent job in describing biomechanics and potential for injury, especially in growing athletes. There are, however, only a few brief preventative solutions for coaches. Yet I think any serious coach, athlete, researcher, or physician who takes care of gymnasts would benefit from having this book as a resource. And even if you are only are involved in gymnastics by watching the Olympics every four years, this handbook provides any curious fan with a great deal of information about gymnastics physiology, biomechanics and injury information. After reading it, you’ll have a new appreciation while you watch the gymnasts in Rio. Thanks so much Emily for providing that insightful review. The book will certainly help me as I manage the multiple gymnasts we see in our clinics, with their various pathologies: gymnast’s wrists, to SLAP lesions, to spondylolistheses. I would like to commend to the blog’s readers one of CJSM’s more recent injury surveillance studies of the sport, from November 2011: Survey of Injuries in Seattle Area Levels 4 to 10 Female Club Gymansts. Stress injuries rank high, not surprisingly…..but I must say I was somewhat surprised to see just how frequently club gymnasts get concussed. Concerning point 3 it is dissapointing that FIG publishes their research in this book and not in a open access publication for all national medical staff.